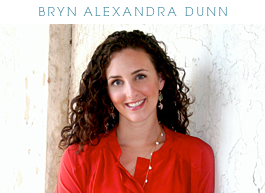 bryn alexandra: The Laundry Room Details! We finally finished the laundry room yesterday! I have all the details for you in case you are curious. For the wall color, I wanted something that was a deeper, darker version of our living room color. 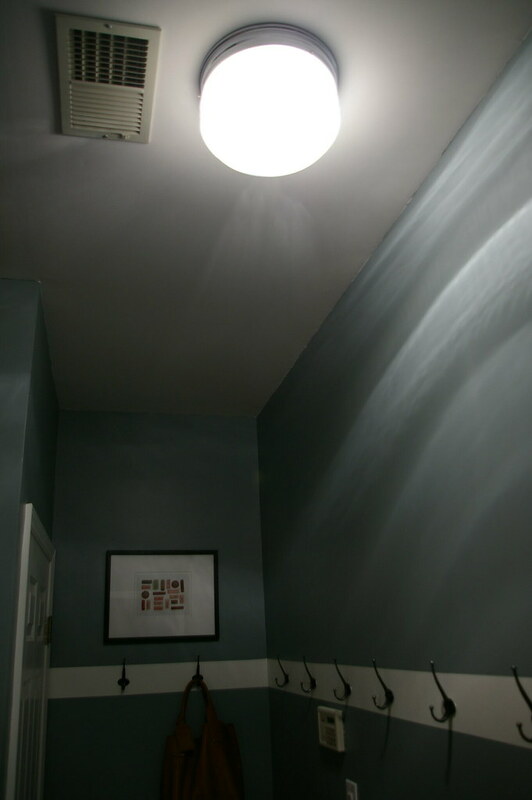 The living room color is also in the entry/hallway and right outside of the laundry room, so it flows really well. I found this color at Home Depot and I love it! I wanted a countertop in the laundry room, but didn't want to spend a lot of money. I looked at a couple different options (for example, a desk top from IKEA and the butcher block countertop from IKEA) but decided to go with the plywood. It was so inexpensive and easy (Lowes cut it for me). I just rubbed some Danish Oil on it and it was good to go! I like the warmth it adds to the room and it's SOOO great for folding, etc. I love the little rug - it's so soft. It's a vintage Turkish rug from eBay. I love having things I use a lot within easy reach (screw driver, leatherman tool, permanent markers, etc). The dryer sheets make the laundry room smell really good. I got the amber glass knobs on Amazon.com. They match the counter top really well (not planned). Here is a shot of all the chalkboard area we have. It's actually really helpful, I love it. Here is a shot of the counter without the lights on.. as you can see it's pretty dark. It's helpful having the option of extra light for when I need it. And here is the laundry room in action! (Some of my clothes air drying). These hooks have been the best thing ever. The cabinets store all my DIY stuff. It's so so helpful having everything organized and at reach unlike before where it was just mad chaos. It's not the prettiest form of organization, but it works. 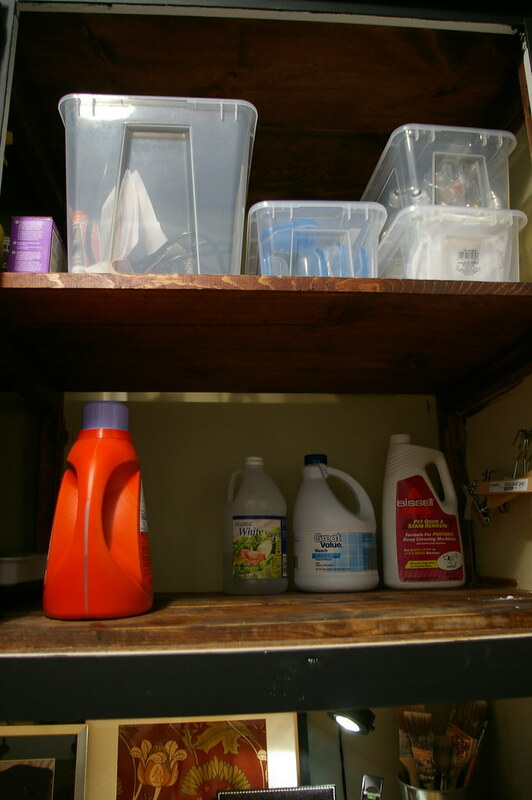 Laundry detergent on the first shelf. On the second shelf, my palm sander and it's stuff, nails/screws, lightbulbs and outlet covers. 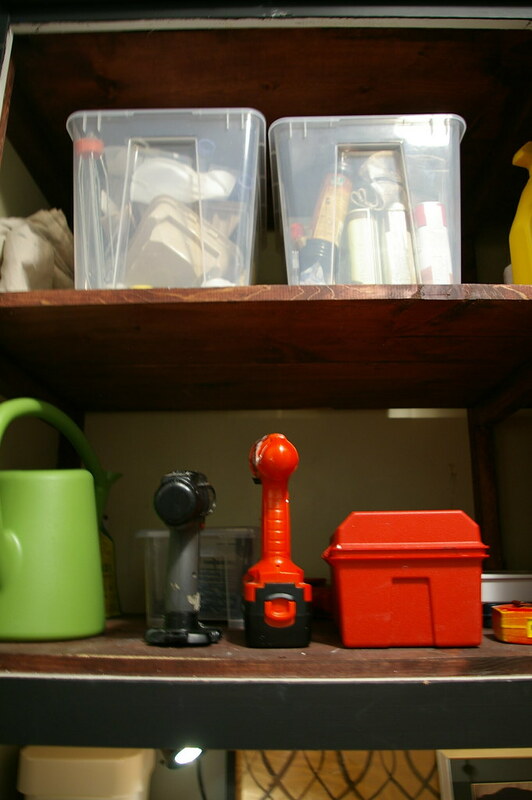 My watering can, drills and tools on the first shelf. Drop cloth, painting supplies and furniture supplies on the second shelf. All the plastic boxes you see are from IKEA. As I mentioned before, I wanted to install the IKEA OTTAVA light in this space but the space really needs a flush mount. We actually installed the OTTAVA and it didn't light the space well enough. It was only $17!!! Can't beat that. 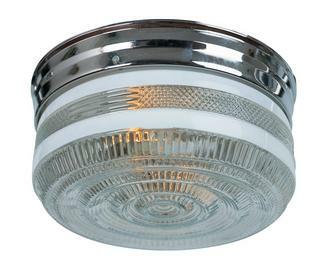 I really love this light, especially the white painted detail on the thick glass shade. It has a schoolhouse feel that goes well with the tile. And did I mention it was only $17?! I think I covered everything! Please ask away if I missed anything and if you have any questions. What great details. I love the new format you chose. Those hooks, may just be what I need. I find myself trying to hang clothes everywhere. I love it! I love the hooks (I've used those too and love them! ), the wall color, and the flooring!! 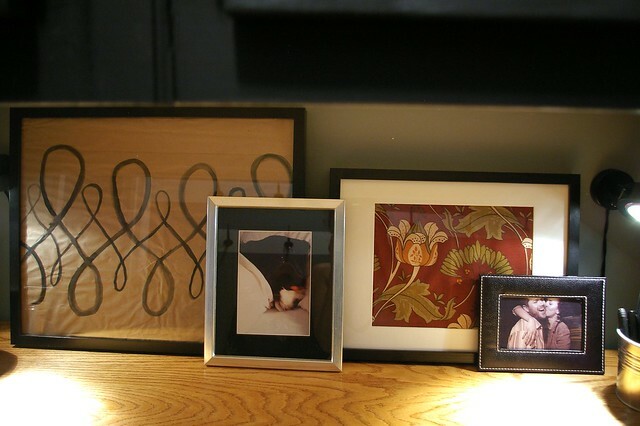 Did you make the piece of art above your bag that is hanging? No I'm sorry I didn't mention that - it's from 20x200.com. This space looks awesome! Great job. I would love to have this for a laundry room. WOW, what a wonderful transformation!!! I love every little detail from the containers for the cleaners to the chalk board doors to the octagon & dot flooring. Now I would be more than thrilled to be stuck there ding endless piles of laundry!! 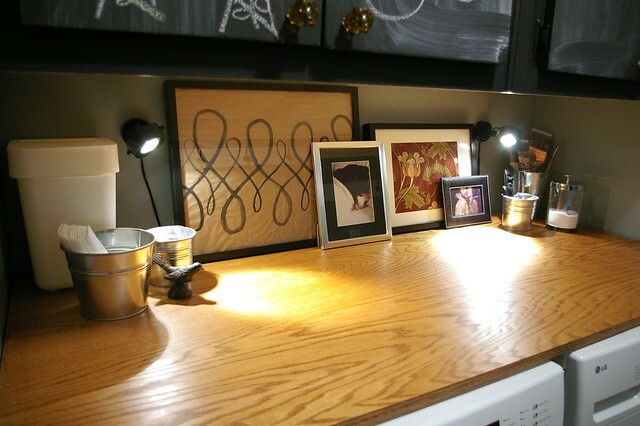 Bryn-you did a fantastic job, my favorite part is the chalkboard cabinets. Love that tile from Lowe's too, affordable and classic! looks amazing bryn!! love the stripe w/ the hooks! looks FANTASTIC bryn! great job! i'll be using this as inspirationo when I have a house with a laundry room someday. 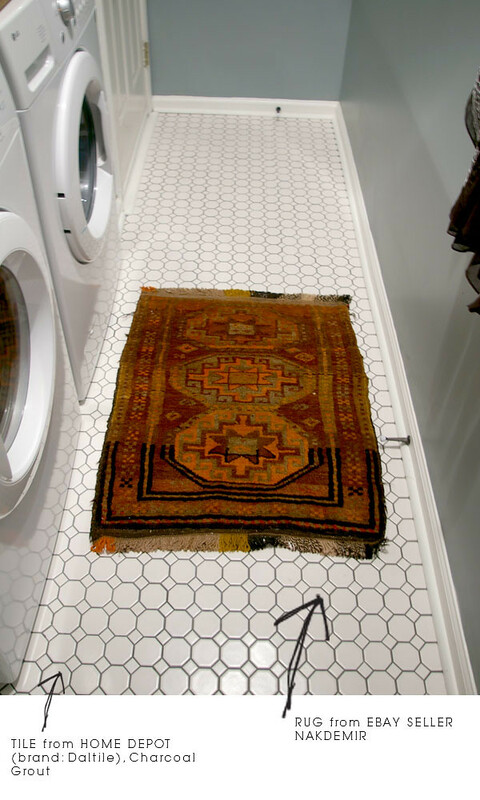 Awesome transformation -- its definitely would make doing laundry way more enjoyable! LOVE IT! As usual, amazing another job Bryn! 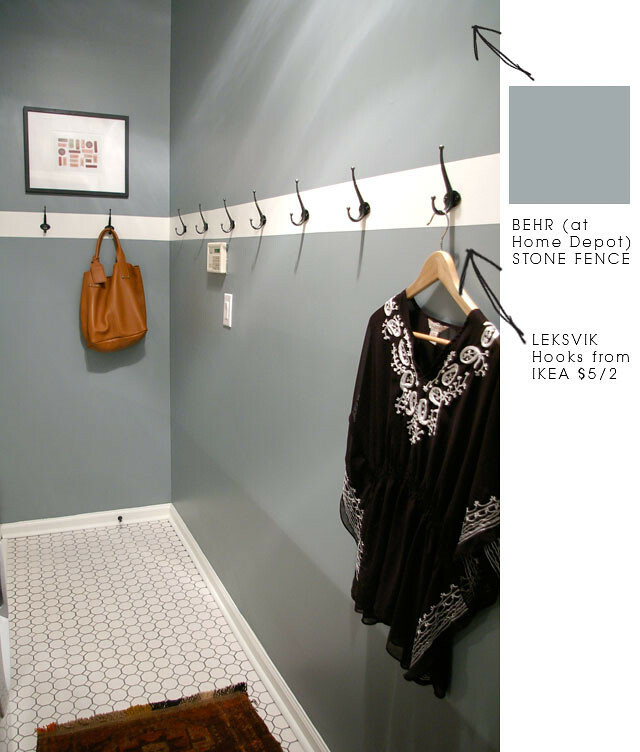 I've started picking out paint colors for my laundry room - we are working on our master bathroom first though -. What a transformation! Love that crisp white stripe. I could use a hook treatment in my laundry room--but I fear I would bump into them all the time. Has this been a problem? Oh no not at all. The hooks are less than 2" deep and I've never bumped into them. We also put in door stoppers so the doors never hit the hooks. Oops!! I forgot to mention where it's from. It's from Lowes! You did a fabulous job! A laundry room remodel is on our list too. You made it seem doable! Thanks for sharing. Wow. What a sophisticated laundry room. The space looks great. I can't decide what my favorite part is because I really love all the choices you made! This looks fabulous, Bryn, and it seems like you solved all of the organizational problems you had. I love that everything has a useful and logical place, too. Great, great work to you and your MIL! You are incredible. It seriously looks so good. I love all the details and especially the artwork. Looks great! 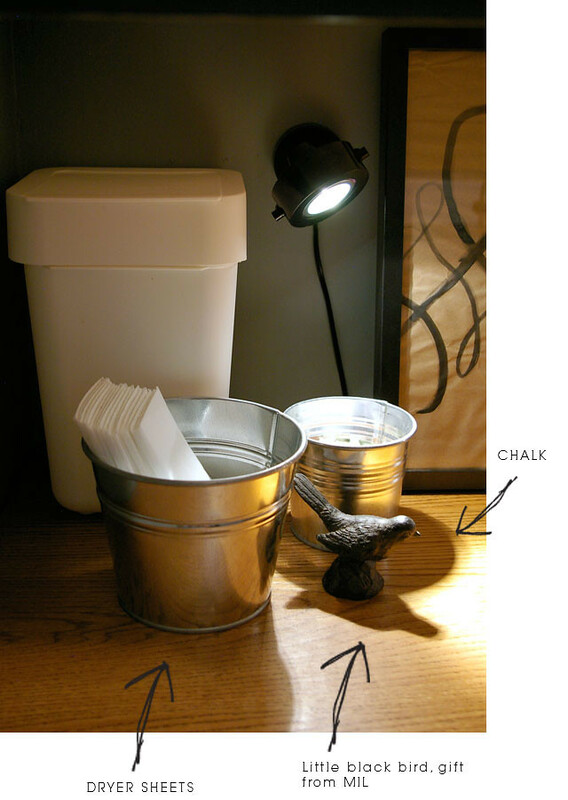 I love the character that the chalk paint adds! Some sweet day we will get around to finishing our laundry room... currently it holds the title for most inconvenient and disorganized space at our house. Looks great! Love the flooring and how everything has its place! Rock on Bryn.....that is one fabulous laundry room! Wow! What a transformation! It looks amazing... I love how you put dryer sheets and Oxy Clean, etc. in buckets and containers instead of keeping them in their typical packaging. Great idea. This looks great Bryn! Great job! AMAZING. I love the color and the chalk board doors. What a fantastic makeover! AMAZING! I love how this turned out, especially the chalk board doors. It makes me want to come over to your house to do my laundry. You did an AMAZING job- I adore the blackboard doors and sweet knobs...also love the floor tile, wood shelf above the washer and dryer, and the way you've made laundry stuff into pretty accessories. Gorgeous. 1) The Ikea (you'd never know!) 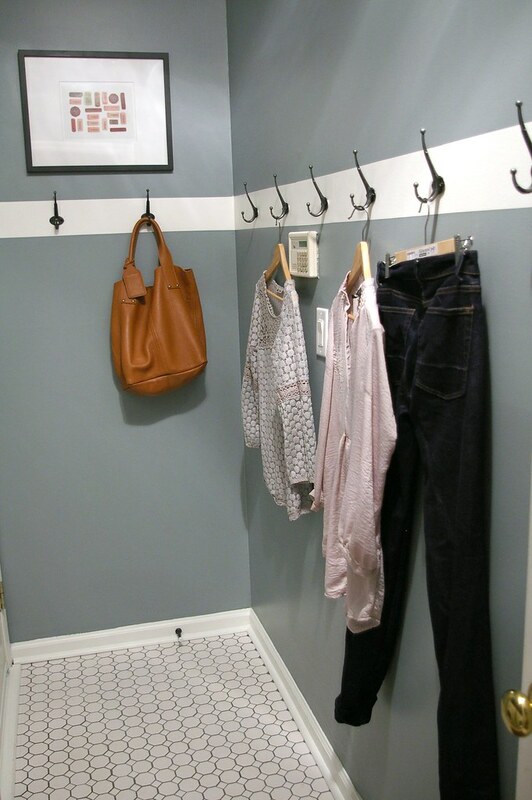 hooks that double as a place to hang bags and clothes that need to air dry! Love it! 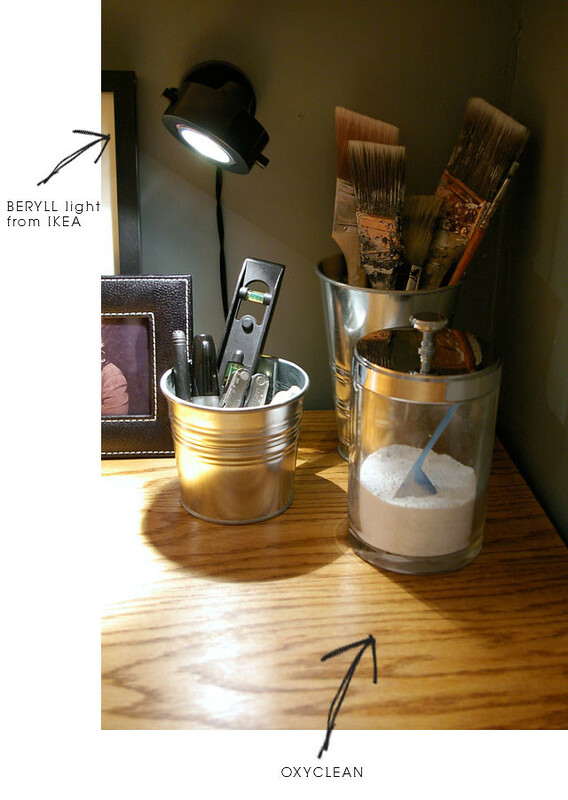 2) The little buckets of things to keep handy -- beats searching through the bins on the second shelves. 3) The clear bins are great for seeing what's inside -- every girl needs her tool stash. Gorgeous! Love the tiles, the paint color, the wood "counter," the hooks, everything! Awesome use of space. And...where'd you get the black top/tunic hanging on the hook? So pretty! it looks awesome, bryn! nice job. This may sound crazy, but I really love the before picture. That may have been the best part of the post (besides the fact that it looks amazing now). Sometimes I feel like everyone else has a perfect house except for me. It did my heart good to see that an amazing decorator had a room that looked...well...less than perfect. It gives me hope! It looks wonderful! Thanks for sharing! I love it! I'm working on my laundry room as we speak! We need to accessorize it and we're creating the bottom two shelves in our bookcase (no cabinets) to be for my husbands cats. I am dying to post about ours but I'm so not done cute-ifying it and what not! Great job! Looks amazing Bryn! I'm throwing away my cheapo laundry rack and buying those hooks! so organized & very chic! Thank you for posting this! 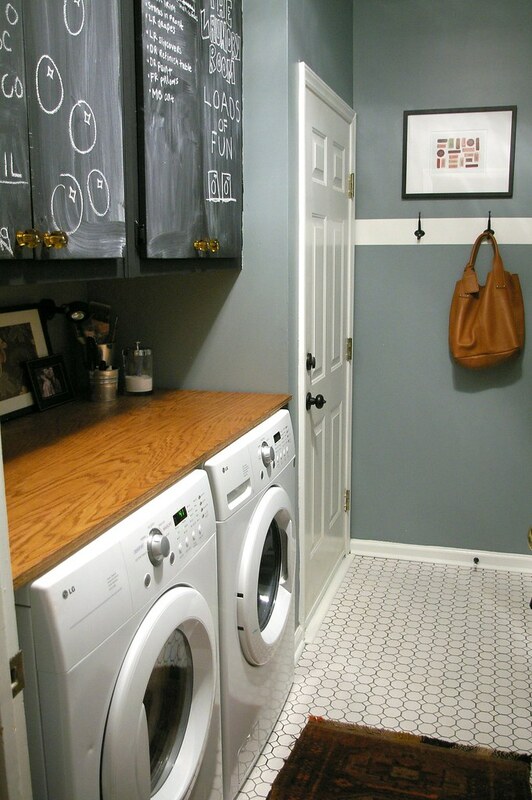 I have almost the exact same laundry room and it has been driving me crazy for YEARS. I am going to get started on the makeover asap! Love those hooks!! Love the room, might make laundry more fun if I did this! If you don't mind my asking, I also love that gorgeous bag. Where is it from? Where is the light from? I've looked everywhere! I love your laundry room! I've been contemplating adding a countertop to my washer/dryer too, but the jostling from the washer's spin cycle has me stumped. Is the plywood simply placed on top of the washer and dryer, or did you stabilize it somehow? Has using the washer caused the plywood to move around? 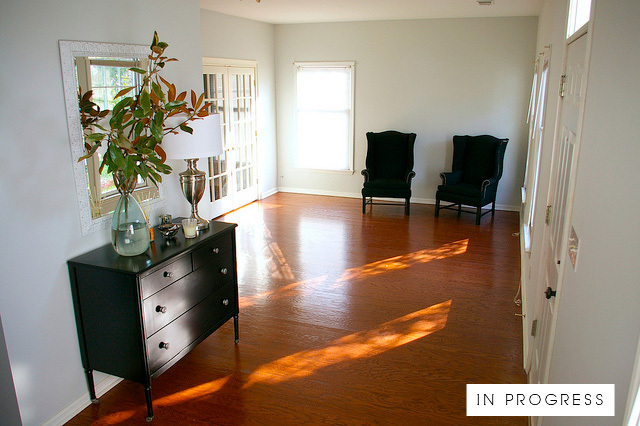 Was the flooring pricey? We just had tile laid in our laundry room & they put the wrong tile layout, so we have the option of having them redo it at their expense (within reason). Looks great by the way!! I have the same question as Lily. Did you just place the wood on top of the washer/dryer? I've found my mud room! Excellent job! Does the floor get slippery when wet? Are the floors easy to clean? Thank you soooo much. Love what you have done! I have a long narrow laundry that connects two spaces. Do you mind telling me how wide your laundry room is? I would love new w/d but the new styles seem too deep for my space. Yours look like they work well in the space you have. You have a wonderful room. LOVE the room and the bag - can you tell me where the bag is from? 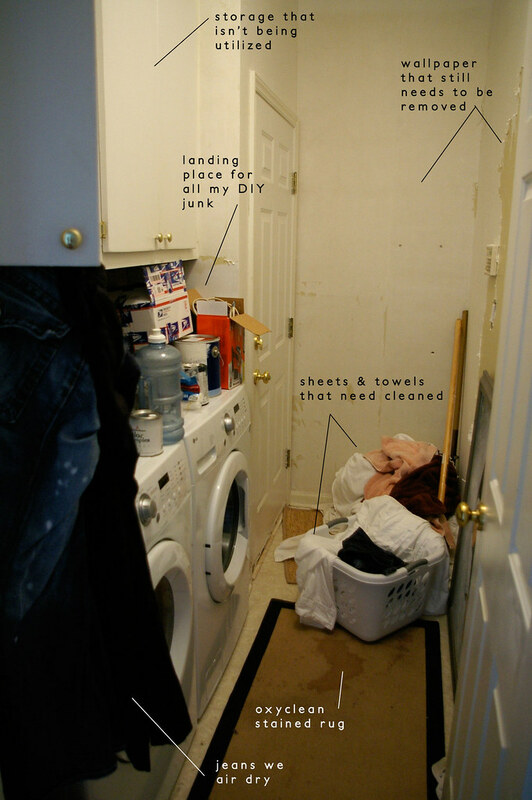 I ran across this on Pinterest, and our laundry room is just about exactly the same layout (our water heater is in the corner by the entrance. Hi...great makeover! Same question as some other posters....did you just float the plywood top over the washer/dryer, or is it hung another way? This could mean the difference between a diy project for me, or endless nagging with the hubby to hang it (or worse, learning carpentry skills myself lol). 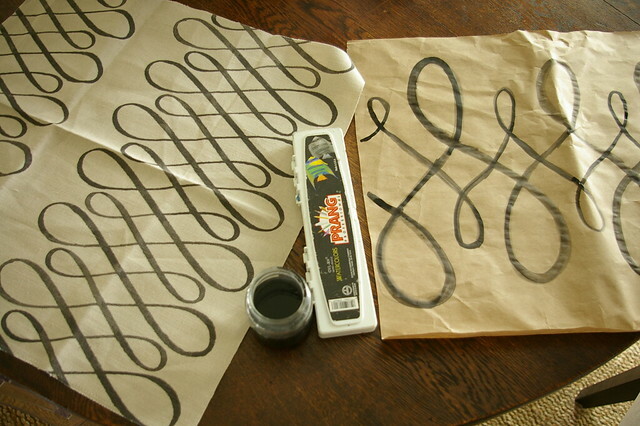 I love your design blog, thanks for sharing your talent! What's the height of the horizontal white strip on the wall? My hooks are 8 inches from tip of hook to bottom. Not sure the best proportions. Thanks! I have the same question and I apologize if there was a reply, but I cannot see any replies to this question. I told my husband about your project and that I wanted to put the plywood over the machines. He liked the idea but his first question was: it would shake like crazy with it just laying on top of the machine. He said we would have to secure it to the wall rather than just lay on the machines in order to avoid the wood and contents on top of the wood from shaking like mad. What are your thoughts? Did you find this to be true? Thanks, the design is awesome. Can you provide the paint name? I LOVE the color on the walls too. Oops, I see the name of the wall color. Missed that, sorry. Please disregard that question. 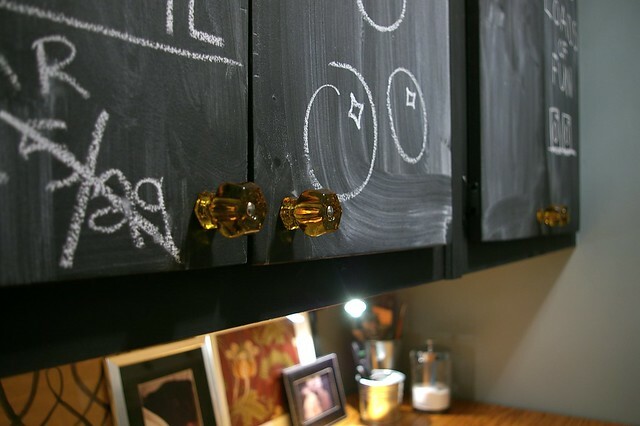 chalkboard idea because this allows you to write down important reminders. However, does it not cause chalk dust all over? Anyway, thank you for sharing. Same question. Love your laundry room. Inspired to do the plywood on top of washer and dryer. Is it just resting on the cheap rubber mats? Did you put any top coat or varnish over the wood or just the oil? I love this idea! I am def. going to get my husband to do this in our new home! Just wanted to say thank you for the inspiration! 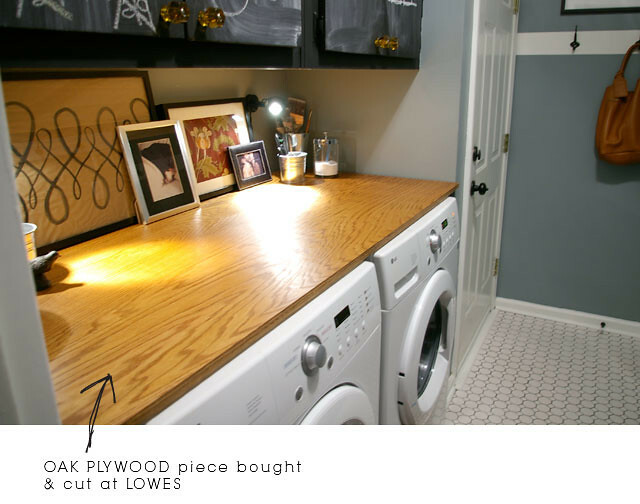 I added a counter like yours to my laundry room and LOVE IT! Hi, just curious if the cabinets are the same cabinets in the before picture or if you got new ones? If they are new, are they just basic cabinets from Lowes or HD? How did you mount the plywod? Is it attached to anything?